Sony have released a range of new Bravia Link modules that expand your Sony Bravia HDTVs, letting them link with a plethora of other devices, and wirelessly stream HDTV from other sources to your Bravia TV. Unfortunately, they’re not exactly cheap, and certainly don’t offer all that much in the way of functionality when you consider their cost. Worse, the only people who’d be prepared to pay the $1400 Sony are charging for all four units are the type of people who’ve jsut seen their entire industry implode in a cloud of ignominy – investment bankers! So what are Sony offering? Two devices, a transmitter and receiver, connect to your Bravia TV and another sources of TV content. 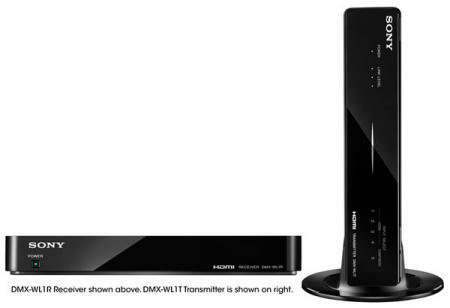 The receiver plugs into the back of your TV via HDMI, while the transmitter connects to up to five different HD sources, and transmits the content wirelessly to your Bravia TV. And the price for doing without wires? $800! A DVD player that plugs into the back of the Bravia set, and whose menus then become incorporated in the Bravia’s own menus, leading to a seamless interface and 1080p upscaling. It’ll set you back $200, which seems a high price to pay for seamlessness! Adds another four HDMI ports to your Bravia set, for no other reason that Sony can think of than to “simply relocate HDMI inputs from the back of your TV to an area easier to access to other A/V equipment.” In other words, it’s a port extender, only one that will cost you $150!! Streams on-demand films and TV shows from Amazon’s Video On Demand and YouTube directly to your Bravia TV without the need for a PC. Oddly, it uses Ethernet rather than WiFi, so you’ll still need wires, which kind of makes you wonder why they bothered developing the Wireless Link Module! All in all, the world’s most pointless overpriced range of HDTV accessories. Good one Sony – just what we need in these trying fiscal times!